Quark matter – an extremely dense phase of matter made up of subatomic particles called quarks – may exist at the heart of neutron stars. It can also be created for brief moments in particle colliders on Earth, such as CERN's Large Hadron Collider. But the collective behaviour of quark matter isn't easy to pin down. In a colloquium this week at CERN, Aleksi Kurkela from CERN's Theory department and the University of Stavanger, Norway, explained how neutron-star data have allowed him and his colleagues to place tight bounds on the collective behaviour of this extreme form of matter. But they forgot one thing........the time for the process of GRAVITATIONAL COLAPSE to the creation of a so-called DEGENERATE NEUTRON needed to create a neutron star exceeds the 15 minute decay rate of a free neutron by many hours. Pop-Cosmology at it's best when displaying it's ignorance of nuclear physics. ^^^^^^^^^^Still as thick as two short planks. They forgot nothing, lamebrain, they just happen to understand science better than some uneducated cretin like you. Benni> But they forgot one thing........the time for the process of GRAVITATIONAL COLAPSE to the creation of a so-called DEGENERATE NEUTRON needed to create a neutron star exceeds the 15 minute decay rate of a free neutron by many hours. Keep up the good work Benni, the bin men will be round later with their bin lorry to collect the fall out! Yep, and then Benni can clean the floor, as that is all he appears to be qualified to do. Where did you get the idea that the process of the formation of a neutron star is that all the matter suddenly turns into neutrons and then collapses? This is clearly silly! The process of becoming a neutron star begins in the centre of the collapsing star where densities reach those approximating that in the atomic nucleus in which we all know neutrons are stable. Your argument bears no relation to models of neutron star formation. For sheer imagination Benni, persistent, stamina and when all lose their rag in frustration as what little brains we had we lost them hitting our heads on the wall, nobody told us we would become punch drunk, for all this and more this deserves 5stars. It was all in fun RNP, you know, jesting. It was a joke RNP, I hope you could see it - sometimes their more appropriate, hence the bin men, they arrived immediately did they not RNP. I am sorry if I misunderstood what you were trying to say, but I must point out that your English is rather confusing. We are the bin men! It is Yorkshire English, as english as most english comes now a days, coming from the British Isle. Even Yorkshire English, this had all the hallmarks of a joke, and we all fell for it, jonesdave got his comment in second before I refreshed, you can see I read his mind - I was to busy crafting my reply to Benni's which I thought was second but turned out to be third. This is what adds to my confusing charm - thanks for the complement by the way. Technically a neutron is a proton of neutral electric charge courtesy of the protons constituents quarks. To say as phys.org is claiming "may exist at the heart of neutron stars" it does exist at the heart of protons as quark matter, as it is the quarks constituent matter. This is not to say it is at present technically observable, the nub of a neutron is it does not exist as it is a proton - a neutral proton consisting of three quarks. Perhaps they are not 'real' neutrons. The electrons could be forced into the protons by intense gravitational forces only, no strong force to hold them there if/when gravity fails. The standard theory shows half the universe's elements heavier than iron come from neutron star collisions. This indicates the atoms retain information on their original state, mostly iron from star cores. No decay until gravity fails in this scenario. I don't have an an "argument", just the raw data of nuclear physics experiments which has yet to exhibit an "argument" for the existence of a DEGENERATE NEUTRON. in which we all know neutrons are stable. You freelance journalists who have never seen a Differential Equation you could solve really enjoy your science fiction narratives.......there is no such thing as an unbound neutron that is "stable". You've been reading too much Pop-Cosmology funny farm pseudo-science. "Most of the basic models for these objects imply that neutron stars are composed almost entirely of neutrons"
So what qualifies you to change the criterion from those of the experts in Pop-Cosmology? Just being a freelance journalist as you identified yourself in the past as being? How about freelance science fiction writer as a more appropriate title, one who has more of his own facts than his own Pop-Cosmology experts at WkiPedia. .......there is no such thing as an unbound neutron that is "stable". FANFARE!!!!! (Wild cheering in the background).We agree on something!!!! The problem you have is that there are no unbound neutrons involved in the formation of a neutron star. You, and everybody else, know full well that I am not a "freelance journalist", and your need to constantly repeat this lie only serves to underline your own desperate insecurity. This seems remarkable to me given that you claim to be a nuclear engineer. Never mind DEs, he can't even do basic maths to work out a Schwarzschild radius when he's been given the mass! there is no such thing as an unbound neutron that is "stable"
"Most of the basic models for these objects imply that neutron stars are composed almost entirely of neutrons". ...they don't exist because the definition of a NS is that neutron stars are composed almost entirely of neutrons. Hey, neophyte of Pop-Cosmology living on the funny farm plantation of pseudo-science, at least get your literacy updated to how your own Pop-Cosmology experts define the makeup of NEUTRON STARS. You sound as if you don't like their definitions? I got it, your smarter than your own experts, right? Capiche, got it, no wonder you've never seen a differential equation you could solve mister freelance journalist that your NOW trying to deny. You haven't even TRIED to find out what the actual science says! You have again constructed some weird, and clearly nonsensical, distortion of the truth and are trying to blame the resulting silliness on the science.
" When all nuclear fuel in the core has been exhausted, the core must be supported by degeneracy pressure alone. .......... Electron-degeneracy pressure is overcome and the core collapses further, sending temperatures soaring to over 5,000,000,000 K. ...... As the temperature climbs even higher, electrons and protons combine to form neutrons via electron capture, releasing a flood of neutrinos." Do you see? The neutrons are produced "in situ" from the protons and electrons (and already present neutrons). There is no need for unbound neutrons. Just love this Pop-Cosmology psycho-babble from you. If there are no unbound free neutrons with a lifetime decay rate lasting millions of years longer than the OBSERVABLE fifteen minute known decay rate OBSERVED in the Large Hadron Collider, then there are no NEUTRON STARS, and if you want electron emission from a neutron it won't occur until a neutron DECAYS because all the electrons that escape via ELECTRON DEGENERACY will have long escaped the system before GRAVITATIONAL COLLAPSE could prevent their gravitational capture, same with anti-neutrino gravitational capture. You can have all the abundance of protons you want, but the near light speed distances of tens of millions of miles those electrons & neutrinos travel upon neutron decay makes them irrecoverable to the system upon gravitational collapse. The neutrons are produced "in situ" from the protons and electrons (and already present neutrons). There is no need for unbound neutrons. Don't bother. He doesn't understand what the "free" in "free neutron" even means. He just sees "neutron" and thinks "a neutron is a neutron is a neutron"
........free unbound neutrons do not have a half-life decay rate & you don't know why, and the reason you don't know why perfectly demonstrates everything I have ever stated about your competency regarding your comments about nuclear physics. Ok, you want to be the next Pop-Cosmology genius around here, just explain the radio-active decay process by which a FREE NEUTRON has a half-life decay rate? Can't do it can you? Maybe RNP or Jonesy? Schneibo? A neutron is a neutral proton; the quarks redistribution of their polarity creating a neutral proton "neutron" the neutrons instability decay rate is due to the quarks and their interaction with the electron and neutrino we now know the neutrino alternates between a neutrino into an anti-neutrino in flight due to their chirality. This implies neither a neutron or a proton exists, they are creations of quarks, electrons and neutrino's, their combination of properties creating a nucleus that has the properties that we have prescribed to what we call the neutron and the proton. Consequently this constant bickering on the how a nucleus exists in the neutron star has to have the added bickering on what constituents the nucleus, as it is the nucleus which constituents the neutron star, and the neutron stars properties are dictated by the Quark, Electron and Neutrino and how they are arranged in the Nucleus! They are not free, get it? I dare you to take your objection to the forum here Benni. Still so terrified of forums? Good suggestion, that could apply to many of the wooists around here. In Benni's case, he has had the Pauli Exclusion Principle explained to him in baby steps, with links. So I very much doubt he is ever going to get it. Another link, but the loon still won't understand it! Dead on wrong........this is BETA DECAY not RADIOACTIVE DECAY, if you had even the slightest concept of nuclear physics you'd know the difference. You Pop-Cosmologists need to first learn how to solve Differential Equations before wandering off into the weeds of funny farm pseudo-sciences & convoluting one manner of particle decay process with another. Why? You can't even do basic maths! And WTF do you think beta decay is? Jesus! Give physics.stackexchange.com, or physicsforums.com, or another forum a try. Been doing the forum for years, mostly electronic circuit solutions, under a different name of course. In this thread alone you proved you have no understanding of radioactivity Benni (which for a long time has been known to occur in the form of Alpha, Beta, and Gamma radiation), or half lives as it pertains to decay (which in the case of free neutrons happens to be 10 minutes, or 15 minutes mean lifetime). A nuclear engineer should really have a firm understanding of these things, and you obviously aren't one (I really hope to god no one has allowed you close to a nuclear facility). Your lack of knowledge of mainstream theories on the formation of neutron stars is on display here also. If you are going to chop down a theory you must have an understanding of the theory you're trying to chop down in the first place. You fail at disproving any of the science here at any level. You also fail at providing any alternative theories. You're just plain failing, which I suspect also happened in your engineering courses, am I right;)? Kron>In this thread alone you proved you have no understanding of radioactivity Benni (which for a long time has been known to occur in the form of Alpha, Beta, and Gamma radiation), or half lives as it pertains to decay (which in the case of free neutrons happens to be 10 minutes, or 15 minutes mean lifetime). A nuclear engineer should really have a firm understanding of these things, and you obviously aren't one (I really hope to god no one has allowed you close to a nuclear facility). In this battle with Benni I see you have called on the services of 8 sock puppets, but then to do battle with the calibre of Benni you need an army to back you up! Benni stands his ground, Kron - on his own shanks's pony with no help from sock puppets Kron, maybe he is leading you up the garden fence! Has anyone stopped to think the vast majority who frequent phys.org have not seen any need for differential, calculas, even a calaculator as any calculation is instictive as making sure you still have all your digits still intact after that battle with the yorshire grocer with your last farthing and certainly on such a discussion as this is not worthy of merit and certainly does not require the back up of 6 sock puppets jonesdave! or half lives as it pertains to decay (which in the case of free neutrons happens to be 10 minutes, or 15 minutes mean lifetime). OK, mister Pop-Cosmology genius.........you erroneously believe that a free neutron has a literal half-life decay process....... so lead us to the dataset from the Large Hadron Collider that anyone operating that facility has ever come across HALF A NEUTRON. Tell us, what does half a neutron look like? Yeah, like the existence of one half of a neutron. I wonder what the Pop-Cosmology crowd living here thinks that that is made of. I'm a Nuclear/Electrical Engineer. Spent 6 years in engineering school learning this stuff, plus almost two years worth of continuing education credits beyond that. I doubt that a Nuclear/Electrical Engineer would be unable to grasp even the basic principles of physics as you continue to demonstrate. I mean you don't even get the basics of the BB theory, or black holes, or neutron stars or relativity. Just the logical consequences of an invariant speed of light seem to be beyond you. Ojorf> That seems highly unlikely. Light radius stars are a more correct description Ojorf, time moves on - we are even detecting background radiation from proto-planet disks in are galaxy to this present, day and stars are born in the matter ejected from the light radius star forming spin axis Fermi bubbles. You criticise Benni with the back up of 8 sock puppets - it sure is a sad way to bolster your flagging credentials you have had to sink so low! What are you talking about, loony tunes? I don't have any sock puppets. I don't need them. I've never been banned. Why don't you go away, learn some science, and stop polluting this place with inane drivel? Only a 6 year old could have asked that question! Half-life, dummy. Look it up. It is used in all types of radioactive decay. We use it to date things. That link is for 15-16 year old students in the UK. Maybe you never got that far, education-wise. Or haven't yet. jonesdave> What are you talking about, loony tunes? I don't have any sock puppets. I don't need them. I've never been banned. Why don't you go away, learn some science, and stop polluting this place with inane drivel? When your inquisitive reply gets its quota of 5stars it will come to to you the defintion of all your rating sock puppets, why do you think your rating is so high! For instance this is not classed as a rating comment - but you know this. why do you think your rating is so high! Because I'm dealing with actual science, whilst you are talking indecipherable crap? It is used in all types of radioactive decay. We use it to date things. Mister Pop-Cosmologist, half-life radioactive decay is the time it takes for a given mass to lose 1/2 it's mass. Free unbound neutrons NEVER decay by losing half it's mass within ten minutes of becoming free unbound sub-atomic particles. If you still think this isn't the case, then show us the dataset where half the mass of a GIVEN neutron has been discovered. Maybe you think such a half neutron mass would look like a half-moon? Just goes to show the luny depths Pop-Cosmology goes to hang onto it's fantasies. Hell's bells man, until I started bringing up the topic of neutron decay several months ago, Pop-Cosmology neophytes like you didn't even know free neutrons had a lifetime 15 minutes decay rate, at least you guys have learned something other than practice honing your name calling skills. ^^^^^^^See what I mean? Complete wazzock. No way has anybody ever let this loon anywhere near a nuclear power plant! Wrong! Where has all the mass gone? Wow, a nuclear engineer that does not understand half-life, must be a world first. Add half-life to Benni's list of incomprehensibilities. ....that you even ask this question with your initial response of "Wrong" is the evidence why you are only capable of living within the fantasies of Pop-Cosmology funny farm pseudo-science. I'll say it again for everybody's entertainment purpose at your expense, there is no such thing as HALF OF A NEUTRON. So, bring it on Pop-Cosmology neophyte, prove such a sub-atomic particle of mass exists. As you point out jonesdave, ratings are for scientific insights not whacking moles! granville583762> why do you think your rating is so high! jonesdave> Because I'm dealing with actual science, whilst you are talking indecipherable crap? So we can take it that after a hard day dealing with actual science jonesdave where your ratings are well deserved, when your rating benefactor sock puppets come to your aid when it's whacking mole time, we will see no actual ratings pilling up on your comments! Oh dear, what an idiot. This is proof positive that you have never been educated beyond grade school level! There is no such thing as half a neutron, bozo! That isn't what 'half-life' means! If you have 1000 neutrons, and the half-life is 10 minutes, then after 10 minutes, how many of them would you expect to have beta-decayed into protons, electrons and anti-neutrinos? Protons and Neutrons don't exist; they are manifestations of the same quarks. In point of fact there are no neutrons or protons at all as they are a combination of quarks with the help of electrons and neutrino's, we just call them protons and neutrons to distinguish them from each other. They are constructed from the same particles as each other! In reality they are actually Quarks. Let's make the above into multiple choice, to give Benni a chance! Incredible!!! Benni does not even know what half-life means!!! I knew he knew very little, but I had not expected him to be THIS ignorant. Have fun trying to educate him, but do not hold your breath. You know what he is like. Protons and Neutrons don't exist; they are manifestation of the same quarks. In point of fact there is no neutron or proton at all as they are a combination of quarks with the help of electrons and neutrino's, we just call them protons and neutrons to distinguish them from each other. And a surfboard is made of the same quarks as a coffee table. Your point is? A Helium nucleus is 12 Quarks with its accompanying electrons and neutrinos, if you are going to educate Benni in the basics, let's get back to basics as they say and lay out clearly and precisely the order in how our atomic nuclei are actually constructed. jonesdave> And a surfboard is made of the same quarks as a coffee table. Your point is? The point is get all Bennie's little ducks in an ordered row! If we isolate a single neutron, and stare at it for 10 minutes plus change, what can we say will happen? a) there is a 50% chance that it will decay. b) there is a 50% chance that it won't. d) there will be half a neutron. To see how atoms are constructed the only way is to strip them back to the bare bones and build each one up as it is the only way to see clearly how the quarks maintain a physical difference between what we differentiate between what we call neutrons and protons, the quarks play a major role in the quark decay and in comparison oppositely the protons stability where the electrons electric charge is universal between the quark and electron and as a proton is 3 quarks consequently shares the same electric charge as the electron. jonesdave> If we isolate a single neutron, and stare at it for 10 minutes plus change, what can we say will happen? Somewhere in between there is half a neutron! If he attended high school physics or chemistry lessons, then he would already know this. If he knew anything about nuclear physics he would know this. It has become patently clear the proton being constructed of 3 electric charges of opposite polarity its counterpart the anti-proton is constructed exactly the same but with the polarity rearranged, there is not one single anti property as the electric charge is still identical and the quarks having just rearranged their order to attain a negative polarity instead of a positive polarity as they have in the neutron by rearranging to a neutral polarity. This is another insight of humour in response "a) there is a 50% chance that it will decay" I think you will find this is how this question on how half a neutron has arisen, I have not seen this suggestion of half a neutron because it was said to you but I think that's ware its roots lie. that you even ask this question with your initial response of "Wrong" is the evidence why you are only capable of living within the fantasies of Pop-Cosmology funny farm pseudo-science. That isn't what 'half-life' means! If you have 1000 neutrons, and the half-life is 10 minutes, then after 10 minutes, how many of them would you expect to have beta-decayed into protons, electrons and anti-neutrinos? ......but that's what you thought it meant until I corrected you, now you're simply trying to spin your way out of the entanglement of your own words, yeah, Pop-Cosmology on parade. but that's what you thought it meant until I corrected you, now you're simply trying to spin your way out of the entanglement of your own words, yeah, Pop-Cosmology on parade. No I didn't, idiot! I know bloody well what a half-life is you loon. Even if I hadn't taken physics and chemistry at high school. I have a long standing interest in palaeoanthropology. Guess how they date Neanderthal remains? Carbon-14 has a half-life of ~ 5700 years. How much left after 40 000 years? And why? Sorry, you cannot hide your intellectual deficiencies, Benni boy. They are plain for all to read above. ....half-life radioactive decay is the time it takes for a given mass to lose 1/2 it's mass. Lol. So, I'll ask again - what mass, and where has it gone? Idiot. Benni> ....that you even ask this question with your initial response of "Wrong" is the evidence why you are only capable of living within the fantasies of Pop-Cosmology funny farm pseudo-science. Benni appears to be clearly saying "there is no such thing as HALF OF A NEUTRON." Yes, we know! It is because the idiot didn't understand what 'half-life' means. As above, he thinks it means that something is going to somehow lose half of its mass. Understand? Benni> OK, mister Pop-Cosmology genius.........you erroneously believe that a free neutron has a literal half-life decay process....... so lead us to the dataset from the Large Hadron Collider that anyone operating that facility has ever come across HALF A NEUTRON. jonesdave> Yes, we know! It is because the idiot didn't understand what 'half-life' means. As above, he thinks it means that something is going to somehow lose half of its mass. Understand? Ah! The Obfuscation fog begins to clear, it is an inferred half neutron, by Bennies misunderstanding of half life it has been inferred by others that this can be inferred to mean it is possible to have half a neutron, so this is why Benni pleads so innocently and passionately because he did not actually say half a neutron actually exist. This is Obfuscation at its finest jonesdave, even I did not spot it – but still. I'm holding judgement as I've only looked briefly into this literally over the last few minutes as this has been going on for years. AP: "Also note that he thinks it decays in 15 minutes...i.e. he doesn't understand the term "half life" either. He thinks that's just the title of a game." Benni: "free unbound neutrons do not have a half-life decay rate & you don't know why...just explain the radio-active decay process by which a FREE NEUTRON has a half-life decay rate? Can't do it can you? Maybe RNP or Jonesy? Schneibo?" He then fails to understand that beta decay is radioactive decay, and then tells us that half-life is to do with losing mass! So he thinks a neutron's half-life is the time it takes for it to lose half its mass! EDIT: Looks like you figured it out! You claiming the above is like me saying that hot air balloons rise because hot air is less dense than cold air, then claiming that since you have never written this on PhysOrg, I just taught you that. I can't believe you didn't know hot air was less dense than cold air! Also, it is extremely frightening that in 8 years of education, you have no idea what half-life means. Truly impressive. This is new to me, new to science that half life means the decay of a single particle versus a collection of particles. Only a group of particles can have a half life as a single particle does the actual decay where the half life is the number of particles left after a given time. ^^^^^^Yes, you are mistaken. We are talking about free neutrons. A neutron in a nucleus is not free. It has been suggested that the half-life of a bound neutron is of the order 10^32 years. Not something we need to worry about. A free neutron has a half-life of ~ 10 mins. That means that within ~ 10 mins there is a 50/50 chance that the neutron will decay. If we have 1000 neutrons, 500 of them should decay in 10 mins. Of the remaining 500, 250 will decay in the next 10 mins. And of the 250 that are then left....... you get the idea. That means I'm still mistaken because you have said essentially the same, bound or free, neutrons only have a half life, free their half life is 10 to 15 minutes, bound 10^32 years. But as a single free neutron can only last 15 minutes it follows 1000 free single neutrons can also only last 15 minutes so the number of free neutrons is irrelevant! This can of course all change, if a neutron does not decay in 15minutes, but has a half life of 15minutes! Which puts a completely different complexion on things, because like the tortoise and the hare no matter how many subdivisions there are always going to be neutrons left after each half life so essentially jonesdave you have implied a free neutron has an infinite life-span just as a bound neutron! Which comes to a single neutron jonesdave, it does not decay in 15minutes as it is part of the half life subdivisions, it has an almost incalculably long life span as you can only catch neutrons decaying in 15minute by observing trillion on trillion of free neutrons to catch the odd one that decays in 15minutes! And therein lies our perception of neutrons decaying in 15minutes, they do not, only the odd one does and because we observe it we have assumed a free neutron decays in 15minutes. ...because like the tortoise and the hare no matter how many subdivisions there are always going to be neutrons left after each half life so essentially jonesdave you have implied a free neutron has an infinite life-span just as a bound neutron! so according to you that means that there is no such thing as half-life, since there is always going to be left-overs, whether it is Co-60, neutrons, U-239, C-14 etc. Clearly you fail to understand what a half-life is as well. To sum up, a free neutron does not decay in any give time. A free neutron has a half life of 15 minutes! WE ALL KNOW THERE IS NO SUCH THING AS HALF A NEUTRON! granville583762> ...because like the tortoise and the hare no matter how many subdivisions there are always going to be neutrons left after each half life so essentially jonesdave you have implied a free neutron has an infinite life-span just as a bound neutron! 691Boat> so according to you that means that there is no such thing as half-life, since there is always going to be left-overs, whether it is Co-60, neutrons, U-239, C-14 etc. Clearly you fail to understand what a half-life is as well. Genius? Here I was thinking how stupid I was to have ever engaged in a conversation with you. We could all peer into your skull and see what a brain composed of half a neuron looks like. Wouldn't that be more fun? There's confusion in words and interpretation and now as a free neutron does not decay in any given time. Benni is not saying he has a different interpretation on what constitutes a half life as he elaborates "you erroneously believe that a free neutron has a literal half-life decay process" what exactly does he mean by this statement and "has ever come across HALF A NEUTRON" and yet again what does he mean? Is he being facetious, he certainly has cause to as theres plenty of garden fences to be led up. Benni still has not actually said there is half a neutron! At least someone here, other than myself, has it figured out. Jeez, mate, give yourself a ****ing gold star! Not bad, for Yorkshire, is that! Guess what the half-life of Carbon-14 is? Guess how it can be used to date stuff up to ~ 50 000 years old? Oh strewth. Just when we thought we were getting somewhere! Sorry, eejit? What did you say? Which I now have bookmarked and saved on Screenhunter? Half of its mass? Lol. Where has this mass gone, woo boy? You really need to tell people which nuclear plant you work in, so that they can get as far away as ****ing possible from it. Yes? Idiot. Single neutrons cannot have a half life! We keep coming back to my statement - you cannot have a half life unless you have a decay where half life although dependant on the decay requires more than one particle where as free neutrons are single particles and cannot be considered a group because they are not linked and as single particles decay in 15 minutes because you cannot have half a particle, which in essence is the half life when a group of particle reach a single digit. We have reached an impasse, neutrons, single no matter how close to each other behave singly and decay in 15minutes because you cannot have half a neutron, a single neutron cannot have a half life! Tell us Granville - in which year will you finish primary school? Did you not read the bit that I wrote about single neutrons? They have a half-life of ~ 10 mins. Yes, dear? So, what is the chance of one decaying within ~ 10 mins? Is 50/50 a good guess? Somebody save me from this morass of ignorance and stupidity..... I had some razor blades, but I think I chucked them. Starting to regret it now. Perhaps there is some whisky somewhere..............nope. Bugger. One thing I have learned from Granville - education system: Lancashire >>> Yorkshire! Are they still teaching Old Norse over there, luv? I am taking note of exactly what you saying jonesdave, a single neutron decaying in time 50/50 is a half life but a single neutron is already at the end of the line of the half life process and can go no further and consequently has no half life and its only option is to decay in a precise amount of time. There is no 50/50 left for single neutrons; otherwise we could be watching single neutrons for eternity to decay. Then we certainly would need the whisky bottle with a considerable longer decay than a single neutron or is that half life, well any way, the way whisky extends its life span we will certainly have got this genie back in its bottle when reach the last drop or is that half a drop, we will leave that to the expert on these matters as Bennies staying sober! This is where the Neutron has a Mean-lifetime of 881.5 seconds …. But this is derived from the time required for a QUANTITY to reduce to half its initial value. As can be seen half-life is not decay-time i.e. 881.5 seconds is half-life time not the decay-time. We could potentially be sitting staring into our whisky bottle jonesdave for the age of the universe before our final neutron decays unless you relent to Bennies implication of 881.5 seconds or the alternative - half a neutron it all depends which you find the most palliative. As those whisky fumes decay jonesdave, and that single neutron comes back into focus - the pressing issue remains, despite a potential infinite decay-life, real life down to earth realities are that a neutron decays and 881.5 seconds is generally accepted as the time for a single neutron to decay. As the age of the universe is an infinite life-time so effectively a neutron does not decay. There are two possibilities - either the single neutron decays in 881.5 seconds or it simply does not decay! And given a large enough cloud of decaying neutrons going through beta-decay is returning back to protons acquiring that ejected electron to hydrogen - acquiring neutrons from the cloud, there by stabilising the decaying neutrons to the three isotopes of hydrogen. granville583762> There are two possibilities - either the single neutron decays in 881.5 seconds or it simply does not decay! As neutron decay is measured in zero to billions of year's jonesdave, "Wrong" needs a we bit more elaboration, unless you are intimating a neutron continues its half-life decay on reaching a singular neutron. I've already explained it as simply as I can. The same applies for a single, isolated neutron as it does for a single neutron surrounded by other neutrons. There is a 50/50 chance that it will decay within its half-life. As you extend the time beyond the half-life, there is an ever greater chance that it will decay. However, there is a small, but finite chance that it could stick around for a long time. The 50/50 chance only applies to billions of neutrons, because in the billions there are neutrons with billion year decay-life. When you get down to the last neutron you are dealing with the neutron that has the longest life span, it has been weeded out from the lesser neutrons. This implies we are staring at the longest decay life neutron with an almost 100% certainty. Meaning it does not decay in 881.5 seconds and no one alive is going to live long enough to see it decay. Pretty much. Another way of thinking about it is tossing a coin. There is a 50/50 chance that heads will turn up on the first throw. Ditto for every subsequent throw. However, if you compute the odds of throwing heads 10 times in a row, it is very unlikely. But not impossible. Effectively the error of chance has been taking out of the equation because we have isolated the longest decay life neutron from the cloud – this has to be so otherwise the half-life decay process would not even remotely follow any mathematical formula because the neutron decay would occur randomly and haphazardly – then you could get two identical clouds of decaying neutrons and no mathematical formula would be able to predict the mass of either cloud after the same amount of time - as one cloud will have completely decayed where as the other is unpredictably hanging around. This is the consequence on computing on chance - chance by its very nature is unpredictable and numbers do not come into it. The fact the half-life formula gives anything of a predictable result indicates chance does not come into it. The reality is neutrons have an infinite range of decay-life's where each one is decaying after its allotted life span and we observe a neutron decaying as it comes to the end of its 8 second or 8 billion year life then the next micro second another decays, so in no time at all there are no micro- second neutrons left. Has anyone collected a cloud of a billion neutrons and observed the constant decay over the coming months and years as the 881.5 second half-life whittles down the numbers, while observing single neutrons in isolation and recording how long they take to decay while constantly observing and weighing the diminishing billion neutrons? I thought you would take issue with neutrons having allotted life spans Benni, but this subject needs to be gone into in a lot more depth than just what I can inject Benni, because I personally, do not yet know, given a million isolated neutrons do not yet know how many of the isolated million neutrons will be left after 881.5 seconds? given a million isolated neutrons do not yet know how many of the isolated million neutrons will be left after 881.5 seconds? Zero will be left, if by "isolated" you mean unbound from any atomic mass. It doesn't matter if one million or one trillion become free unbound neutrons all at the same time. The 15 minute clock starts ticking at the moment they are separated from an atomic nucleus. If a "cloud" of any quantity are unbound at the same exact moment in time, that neutron cloud will DECAY inside of 15 minutes all at the same EXACT moment in time. granville583762> given a million isolated neutrons do not yet know how many of the isolated million neutrons will be left after 881.5 seconds? Benni> Zero will be left, if by "isolated" you mean unbound from any atomic mass. The neutron decay is going to around for untold trillions of years if not for ever! ......yep, but the DEGENERATE NEUTRON Pop-Cosmology quacks would have everyone believing otherwise, or they couldn't have their fabled black holes which by all accounts start with neutron stars, this being the reason a DEGENERATE NEUTRON is so critical to the funny farm Pop-Cosmology crowd. ^^^^The irony of real scientists being called 'quacks' by this uneducated bozo! Oh yes, Oh dear because unless I very am much mistaken we have two graduates with conflicting views, with myself just being inquisitive jonesdave, as I have no views on this matter. I can foresee many unforeseen Oh dears ahead! It is your construct of half a neutron that intrigues me which when we get the basics..
FFS don't you listen? THERE IS NO SUCH THING AS HALF A SODDING NEUTRON! UNDERSTAND? jonesdave I would never have made an issue of another commenter typing anything concerning the suggestion of half a neutron, and I would have never have picked on it because I have a sixth sense for these things and when to leave them well alone because there is no explanation forth coming possible, it's not going anywhere - it's just a head ache for nothing but it still interesting, a sort of physiological challenge because that's all it is. Even so I could not detect Benni actually saying it even with my sixth sense! Even so I could not detect Benni actually saying it even with my sixth sense! Have a look upthread at Benni's definition of half-life - it is along the lines of "the time it takes something to lose half its MASS." How can a neutron lose half its mass? Obviously it can't. Otherwise we'd have half a neutron! How can a neutron lose half its mass? Obviously it can't. Otherwise we'd have half a neutron! ..........finally, you've learned something from me, and if a neutron is unable to lose half it's mass over a given period of time it doesn't have a decay rate that is measured in 1/2 life, it simply has a 15 minute decay rate with no adjuncts. Half-life is nothing to do with mass! Jesus H. Christ. It is the time required for 50% of an isotope (usually) to decay to another isotope. Such as 40 K to 40 Ar. In the case of neutrons, it is the time taken for 50% of free neutrons to decay to protons, electrons and electron anti-neutrinos. From memory, the term 'half-life' was coined to quantify the stochastic likelyhood 'average time interval' that an 'ensemble' of numerous COMPLEX atoms would 'fission' to produce lighter atoms OR to 'transmute' into other isotopes (with either less/more NEUTRONS). The use of 'half-life' term in other contexts (ie, beta, gamma decays) is, in my opinion, less than helpful in discussing different contexts; especially that of Neutron 'stability/lifetime' (witness the cross-purpose exchanges/confusions in your discussion). The crux or the matter is: a 'free' Neutron not in direct interaction with other neutrons, protons, electrons (or even other energy-inputting 'entities' like magnetic/electric fields and/or their various high-energy radiations like Gamma, X ray etc) has an experimentally measurable 'average MAXIMUM' lifetime (ie, NOT a stochastically derived 'average HALF-LIFE' lifetime). Half-life is nothing to do with mass! .....just how much more fun can the plantation of funny farm Pop-Cosmology get to be. This is what you get when anthropologists like you aspire to things forever beyond your reach. @RC,; 'll stick to the experts' descriptions in the scientific literature, if it's all the same to you. Is that a promise you'll cease from quoting yourself? Christ you're thick! The sad thing is, that you are too thick to realise how thick you are! LOLOLOLOL ROFFLMFAO "half a neutron" What an idiot! @jonesey, if they let this fool into a nuclear plant it was only into the restrooms. Go mop some toilets, @Lenni and mutter imprecations against the sciensetis again. 1/2 life of an element (ie; C14) do not represent the actual decay rate of a neutron on it's own. Only when bonded with a specified number of protons. No problem, jd; as long as your 'reading' and comprehension of those experts' treatises/opinions is done in the light of the subtle but crucially important difference I highlighted for you in my previous post...regarding 'maximum-life' versus 'half-life' aspect in the two different contexts mentioned. ...1/2 life of an element (ie; C14) do not represent the actual decay rate of a neutron on it's own. Only when bonded with a specified number of protons. See? @Whydening Gyre 'gets' that subtle crucial important difference: between the experimentally measurable 'average maximum life' of a 'free' Neutron; and the stochastically derived 'half life' of a complex atom containing neutrons and protons. Write it up. Every paper I've looked at says you are wrong. Nobody uses the term 'average maximum lifetime'. Nobody mentions a maximum lifetime. However, all of them mention the 'half-life' and/ or 'mean lifetime'. Interestingly, "half-life" and "mean lifetime" are different. The half-life of a collection of neutrons neutron is about 1/e times the mean lifetime of a neutron; thus, the half-life of a collection of neutrons is about 10 minutes, and the mean lifetime of a neutron in the collection is about 15 minutes. But this of course assumes that the neutrons are not in contact with protons, as in an atomic nucleus. Neutrons in a nucleus are generally stable (unless the nucleus is unstable) and thus have a half-life of infinity as far as we know. Neutrons do not decay slowly or do they? All protons are repulsive, however you look at it, the decaying neutron is ultimately going to place itself outside the nucleus as a proton. The instant it is ejected it is a free unbound neutron and if still a neutron subject to the 881.5 second decay. So what is taking place over 1000s of years that ultimately in a nano-second ejects the neutron as a proton, neutrons do not decay slowly or do they? Once ejected as Neutron as it cannot survive outside the nucleus and it is subject to 881.5 second decay turning into a proton which is what we observe! A most plausible and satisfying result almost as painfully slow to its conclusion as the decay its self. Benni was right all the time, but not as he realized it in the way I have arrived at the same conclusion! Now it can be seen Neutron decay is a two stage process where the first part occurs internally in the nucleus with the second stage occurring externally to the nucleus and as such externally, the Neutron is a free unbound Neutron and subject to the 881.5 second decay which is the basis of my original question - In a cloud of unbound neutrons and individual isolated neutrons how long to decay to protons - and we have the answer namely – All decay in 881.5 seconds! This comment thread illustrates the downside of letting the people who are qualified to dry clean lab coats actually comment on science. Most people know they are dry cleaners and don't get confused because they tried on a lab coat either literally or figuratively. Are you not putting your twopence worth in TrollBane? TrollBane> This comment thread illustrates the downside of letting the people who are qualified to dry clean lab coats actually comment on science. Most people know they are dry cleaners and don't get confused because they tried on a lab coat either literally or figuratively. As you appear to be indicating there are a lot of dry cleaning vacancies, are you putting in your job application TrollBane? In the mean time we need more input! This comment thread illustrates the downside of letting the people who are qualified to dry clean lab coats actually comment on science. 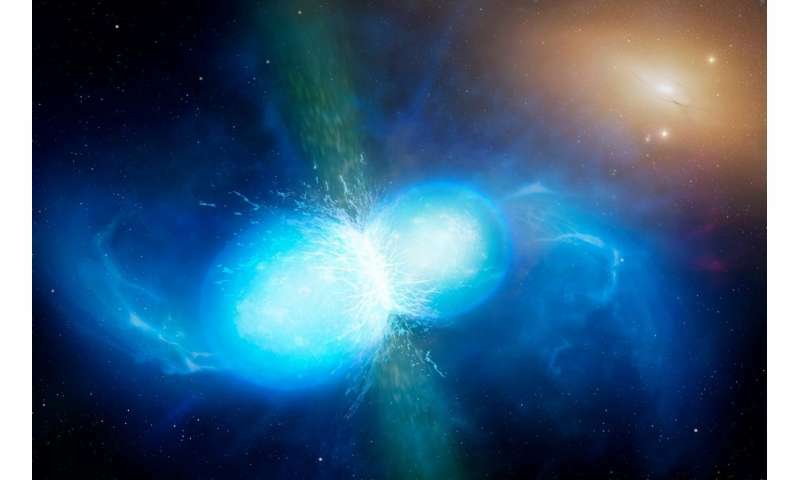 This entire article "Neutron Stars cast light on quark matter" June 8, 2018 by Ana Lopes, is all about the latest guesswork of Pop-Cosmology lacking ANY basis founded in nuclear physics. Creating convoluted explanations about neutron half-life is just part of the convolution because OBSERVATIONAL EVIDENCE for neutron degeneracy does not exist, the consequence being that unless it can be proven that a free neutron can exist beyond it's 15 minutes decay time then neutron stars can not form during a process called GRAVITATIONAL COLLAPSE. It is during this collapse during which time Pop-Cosmology claims fictional degenerate neutrons are created forming the primary constituent mass of neutron stars & black holes............ha, big yawn, just the smallest chink in the armor of that argument bilges the whole theory. ^^^^^^Annnnnndddd..the idiot is back to misunderstanding the whole process! Talk about thick! If the idiot cannot understand what a half-life is, what chance of him getting his few brain cells around the Pauli exclusion principle? Pointless. Worst case of Dunning-Kruger I've ever seen. All decay in 881.5 seconds! Wrong. Which paper did you get that from? None of the ones I've read. .....of course it's nothing from anything you've read because all you read are science fiction narratives better known as Pop-Cosmology. Sorry? What would you know? You are scientifically illiterate, as this thread, among many others, has amply shown. Da Schneib> Interestingly, "half-life" and "mean lifetime" are different. The half-life of a collection of neutrons neutron is about 1/e times the mean lifetime of a neutron; thus, the half-life of a collection of neutrons is about 10 minutes, and the mean lifetime of a neutron in the collection is about 15 minutes. But this of course assumes that the neutrons are not in contact with protons, as in an atomic nucleus. Neutrons in a nucleus are generally stable (unless the nucleus is unstable) and thus have a half-life of infinity as far as we know. It is irrelevant as to what is known, fact or fiction or interpretation of someone else's comments as in the interpretation of the now infamous quote of the century "Maybe you think such a half neutron mass would look like a half-moon" if every reply bar one or two can be expressed as one, two or "gasp" even three syllables! Contrasting comments and Yorkshire thickness. FTFY. What does 'mean' mean where you live? It is possible to interoperate Benni saying half a neutron - the key word is "interpretation" as everyone's interpretation is different as is Bennies, as ultimately it all depends on whether Benni intentionally or subliminally intended to convey the meaning of half a neutron which is what you took Benni to mean. Thanks, @jonsey. You're correct, I didn't. As usual @LenniTheLiar always lies about what people said. jonesdave listening to Benni at face value you might as well clean lab coats as there's a glut of vacancies due to the influx of inexperienced scientists, if you hold your nerve for moment, Benni is saying something behind his fog of scientific expression, which is my approach to all these ideas, I do not immediately denigrate what some is saying as in Benni because he might appear to be uttering gibberish because it is his outlandish idea that is making it sound nonsense. If you have followed me so far you will be able restrain your immediate reaction in Bennies next idea, the mass and remaining mass during and after neutron decay which as you know goes hand in hand with half a neutron! ......your dry humor just went wayyyyy, wayyyyy over jonesy's & schneibo's head.......later on for my next idea, right now I don't have time, I was just checking in to see what was the latest of the greatest, which I guess must be me. I know Benni its delightfully delicious, like discussing half a hole! Relax, mate! Where did you pick up this 'phobia' against new descriptive terms coined in order to clarify certain confusions being caused by the failure to properly distinguish between subtle differences in 'contextual applicability' of existing terms? I used that term advisedly in order to 'encapsulate' the point of difference. All experiments find 'free' Neutron 'decays' after only a short period. No matter how many 'free' Neutrons involved. Sure, tiny 'quantum variables' in experimental 'environment' produce *small* time differences to 'decay', but *any one* free Neutron *always* 'decays' round about an 'average maximum' *short* time very little different from the others. ^^^^^^^References, please. I'm not taking your word for anything. @ Really-Skippy. How you are Cher? Everything down here is fine and dandy. I used that term advisedly in order to 'encapsulate' the point of difference. And he worked real good for that. It pointed the difference out between real scientist words and words coming from the couyon Crankpot-Skippys who come to the physorg to play scientist by making up really weird sounding ways to say something they think will make them sound like a real scientist instead of the couyon they are. References, please. I'm not taking your word for anything. "A free neutron is unstable, decaying to a proton, electron and antineutrino with a mean lifetime of just under 15 minutes (881.5±1.5 s). This radioactive decay, known as beta decay, is possible because the mass of the neutron is slightly greater than the proton." Jd, what has happened to you, that you refuse to check things out for yourself given the new information and clarification I just provided for YOUR self-study/comprehension. I don't ask you to take my word for anything. I merely provide clues, hints and relevant info/insights to help YOU to read your references in the light of the new perspective which should help dispel whatever reading bias keeps 'blinding' you to subtle (and sometimes even all too obvious) wider contextual implications/possibilities in what you are reading. Jd, did you see where even @DS has done that; and then tried to explain to you the crucially different contextual meaning of "mean lifetime" (which I tried to alert you to, by using the term "average maximum lifetime"), and the meaning of 'half-life'. ^^^^^^^^I've already read the literature. I know the answer. I don't need you to advise on anything. The day I become that desperate........................! The half-life of a free neutron is 10.3 minutes. Therefore its mean lifetime is 10.3/ ln2 (0.693) = ~ 15 mins. In just the same way, the half-life of C-14 is ~ 5700 yrs. So, its mean lifetime is 5700/ 0.693 = 8200 yrs. Is there any C-14 left in a piece of material you need to date after 30 000 yrs? 40 000 yrs? So, will there be neutrons still hanging around after 60 mins? Do you know what an exponential decay curve looks like? The difference is that a 'free' Neutron is by DEFINITION 'free' from interaction with other 'nucleons'; whereas Neutrons in COMPLEX ATOMIC nuclei (ie, Neutrons in your C-14 example) DO experience constant Neutron-Proton interactions until 'decay'. See the different contexts, jd? See the different contexts, jd? Show me your references. WTF is the difference ...........................no, sod it. Why don't you join the Physics Forum attached to this site, and ask your question there? Or are you as scared of doing that as Benni? Tell you what, mate, let's use examples other than the 'free' Neutron; where 'half-life' is NOT even a consideration, not even 'in theory', but rather ONLY 'average/mean lifetime' (or as I have tried to further stress it, "average maximum lifetime"). ^^^^^^^So, these guys are talking crap then? Half-life, mean-life, decay-time, exponential-decay, actual-decay- time, experimental-decay-time, measurable-decay-time which are applied to a decaying particle in the nucleus whereas the same atomic particle outside the atomic nucleus free from all interaction by virtue of being free from the nucleus where the particle in this case is the neutron, one fact above all, is it can not exist outside the nucleus so it has no option but to decay! By measuring the particle decay of a block of atoms after a given time by weight it is possible to calculate half-life and consequently mean-life, this is all mathematical because it does not tell you how long your radioactive sample actually existed in the desert except by mathematically calculating over a small time period its reduction in mass, half-life and its mean-life. It is all Mathematical and no actual substance! Which comes to the neutron outside the atomic nucleus concerning the length of time it exist as an identifiable neutron. One fact is indisputably accepted! It has an extremely limited time on this earth as a neutron! The fact that is hotly disputed is the extremely limited length of time this neutron has left on this earth before it decays into its constituent particles! Are we Splitting Hares because it appears arguable, given the tortoise has 611 seconds, it is possible for the tortoise to reach the neutron before it decays before the hare can in 881.5 seconds! The point being made is mean-life is mathematically derived from half-life, where as decay-time is actual time a free neutron takes in its extremely limited length of time it has left on this earth before it decays into its constituent particles. This is hotly disputed, mean-life is a mathematical derivation of exponential decay and consequently has a 50/50 chance of decay, it is half-life! But we know as a fact were dealing with a free neutron, a few seconds either way, the free neutron decays in 881.5 seconds - it has no choice in the matter! Applying half-life to a block of radioactive particles in the atomic lattice to single particle, it no longer applies, the single particle decays, it has no half-life but simply decay-life! Who would have thought jonesdave and his eternal battle with his nemesis Benni could have raised Benni to those lofty spires that are only found when you drive down Kings Parade and park opposite Kings College in Cambridge where only Fellows discuss these extremely finer points of neutron decay outside the atomic nucleus! As the creams always on the top, I'll plump for the top half! You are displaying your ignorance in neon. For ANY kind of decay the probability of decay in any fixed time interval is fixed. So, for a collection of decaying particles, 50% decay within the half-life. After another half-life, 25% of them still have not decayed. So, for 100 neutrons 1 hour is needed before only one is expected to be left. Considering single particles, the fixed probability in fixed time interval still applies. So after one half-life there is a 50% chance of the particle having decayed, etc. You might like to look at this too, as it relates to the differential equation I keep giving you and you can not recognise or solve (e.g. https://phys.org/...c.html). ........plug in the values needed for gravitational collapse to occur & it becomes obvious the time required to create a so-called degenerate neutron far exceeds the 15 minute decay rate of a free neutron, therefore Pop-Cosmology's eternal DEGENERATE NEUTRONS are never possible because gravitational collapse takes too long. You are heroically shadow-boxing again. You have constructed some monstrous distortion of the actual scientific ideas and are valiantly battling the resulting chaos. I can at least admire that. So to relieve you of your terrible burden, let me assure you that the nonsense above has nothing to do with how astrophysicists think neutron stars form. .........then mister freelance journalist who never saw a differential equation you could solve, YOU explain it in the simplest terms YOU think it would be possible for ME to understand, or maybe just give US your best excuse why you can't do it in which case you could at least do it for everyone else here even though you are sure I wouldn't understand it, Ira would certainly like to know, so at least write it up for him. I take it you don't like when I take Pop-Cosmology funny farm pseudo-science & turn it upside down on it's own head showing how one conclusion of it contradicts another. If we are to continue this conversation you need to calm down and try to concentrate on the science. For instance, let me point out that your idea above that "STABLE NON-DECAYING FREE NEUTRONS that have become unbound from an atomic nucleus during a process called GRAVITATIONAL COLLAPSE" is silly. The protons and electrons are also subject to the collapse, but when they are ALL sufficiently compressed in the core of the star the protons and electrons combine (by the process called "electron capture"; see the neutron degeneracy section of https://en.wikipe...e_matter for a description) to leave just neutrons. I.e. There is no need in the models for free neutrons to survive the collapse. My intuition tells me this takes considerably longer than 881.5 seconds where the neutrons are under free fall during this process Benni so are weightless these neutrons being weightless will decay! Do neutrons decay at the same rate under gravity as they decay under gravitational acceleration of free fall where they are weightless? What experiments have been carried out of isolated neutrons under gravity versus isolated neutrons under gravitational free fall because during collapse to the mythical neutron star the neutrons are weightless during collapse? Whether or not all or some neutrons decay it is an undeniable fact neutrons, now you have raised this point do decay, as I do not prescribe to the Obfuscation of the jonesdavies that isolated neutrons do not decay – it is the eternal problem of the free neutrons streaming out of our fusion reactors, they have a bad habit of decaying! The fact the most abundant element in the vacuum of space is a proton and electron - hydrogen - indicates that away from the nuclear and electrical forces of attraction to the proton proves the point Benni, neutrons decay more rapidly in the weightless vacuum of space because there are no free isolated single neutrons in the vacuum of space – they have all decayed! Do I have always answer my own questions that I concoct, especially on others ideas as though they are my own ideas! that your idea above that "STABLE NON-DECAYING FREE NEUTRONS that have become unbound from an atomic nucleus during a process called GRAVITATIONAL COLLAPSE" is silly. "Above 1.44 solar masses, enough energy is available from the gravitational collapse to force the combination of electrons and protons to form neutrons. As the star contracts further, all the lowest neutron energy levels are filled and the neutrons are forced into higher and higher energy levels, filling the lowest unoccupied energy levels. This creates an effective pressure which prevents further gravitational collapse, forming a neutron star." .....and gravitational collapse requires more than 15 minutes. .....and gravitational collapse requires more than 15 minutes, and if you don't want to believe your own experts RNP, then you are nothing less than a rudderless Pop-Cosmology neophyte unable to steer a ghost ship in the middle of a raging storm. There is no OBSERVATIONAL EVIDENCE that such a thing as a DEGENERATE NEUTRON can be created under conditions of gravitational collapse by which Pop-Cos claims neutron stars are created as I quoted above, you have OBSERVATIONAL EVIDENCE to the contrary? How many times have I explained why it does not matter that the collapse takes more than 15 minutes. During the collapse the matter is normal Hydrogen/Helium etc. It is only when all this matter reaches huge densities in the centre of the star that it is converted to pure neutrons by electron capture (as referenced above). AGAIN. There ARE no free neutrons, so the 10 minute half-life of free neutrons is irrelevant. .....and you keep reiterating that same Pop-Cosmology psycho-babble just like in the REFERENCE ABOVE that I linked. There is no evidence that there exists a DENSITY of matter that prevents an unbound free neutron from decaying within 15 minutes after it is created by ANY means by which YOU imagine a neutron can be created. Ok, you in all your Pop-Cos psycho-babble imagine that by some wave of Pop-Cos magic wand that placing a proton within some proximity of an electron with no regard for a neutrino must also be present. Seems to work fine in a nucleus. Except for the neutrino part. The quarks provide sufficient pressure to support the proton against collapse and then the neutron star ceases to exist as it becomes a proton star and side's steps this nightmarish world of decaying neutrons, which in reality like protons consist of three quarks. This requires all the protons to convert to neutrons because there are limits how close quarks can approach each other, the quarks have to convert to a neutral charge to enable closer approach! The proton will resist more strongly gravitational collapse and require a greater pressure to maintain it as proton star requiring a more massive star! Benni idea is well rooted and watered now and is settled in and growing nicely, no amount of pruning is going to stunt its growth, there is only one thing that is going to halt is relentless progression and it is your good self jonesdave, you hold the key, the informative key and I hold the other, you have bring that Irish streak in yourself that every one posses' because I have seen brief glimpses of it jonesdave. I have pondered the same thing, the problem as I see it is the repulsive positive charge, how can that be neutralized except by an electron, in which case creates hydrogen. Pop-Cosmology neophytes comprehend so little about nuclear physics that all they're doing is chasing their tails into ever-tightening circles of psycho-babble. Creating a neutron by claiming pressure of density at gravitational collapse forces an electron & a proton into proximity which by some stroke of magic signals a neutrino to show up from nowhere to create their degenerate neutron, but what they forgot is the >99.9999% most likely event to occur is that hydrogen is created long before an available relativistic neutrino happens by completing neutron mass requirement, capiche? Ouch! The stupid around here hurts sometimes! It's pitiful to watch this. Neutrinos are *produced* not *consumed* during fusion. @LenniTheLiar is lying again. @LenniTheLiar is lying again. Idiot. .........more Pop-Cosmology continuing it's never ending parade of malcontented over-the-hill Trekkies with their name calling rants. When are you guys gonna learn that name calling is not nuclear physics? After you learn enough physics that you know neutrinos are produced by the proton-proton chain which converts protons to neutrons. And after you figure out that pretending people said things they didn't say is lying. When are you guys gonna learn that name calling is not nuclear physics? p + e > n + Ve. Understand, Benni? Have we conserved charge there? Yep, we had + & - = 0. We end up with 0 + 0. Good. What about lepton number? Well, we disappeared an electron, but got back a neutrino, so that's fine. And baryon conservation? We had 1, a proton, and we still have 1, a neutron. All looks good from that angle. No neutrino needing to be inserted on the left hand side of the equation. So................WTF are you talking about? Da Schneib> It's pitiful to watch this. Pitiful but fascinating! When the rivets start flying I just duck behind the steady stream of neutrinos emanating from all that pitiful hot air! What it will create is HYDROGEN, one proton, one electron. There is not enough mass to create a neutron because it is missing the mass of a neutrino. @RC: RNP told you exactly the same thing I had been saying. Glad that you now agree. Lol. He still doesn't get it! If it is missing the mass of the neutrino in the neutron star, this applies in electron capture, an inner atomic electron is captured by a proton in the nucleus, transforming it into a neutron, and an electron neutrino released. Then, in these extremely cramped neutron star conditions do not leave any room for anything remotely like a hydrogen atom configuration Benni. RNP told you exactly the same thing I had been saying. Glad that you now agree. Please read (or re-read) carefully what I said in my above response to RNP's comments. There is no substantive disagreement between him and me re that conventions as such. I merely pointed out the better way to treat 'free' Neutron particle per se for better contextual understanding, reduced possible confusions (which RNP's own reference also takes pains to point out may arise, due to the different terminology/number involved in 'free' Neutrino decay case). That was all I was trying to get you to be aware of, so as to forestall any confusions which may arise if 'half life' treatment/stats are applied to THE 'free' Neutrino decay time 'average maxima' (as that is effectively different from the generalized 'half life' number/period). I tried to further stress that difference, directing your attention to KAON, PION entries in Wiki. Did you check? They don't even mention 'half life'. What should have been obvious to you is that anything that has a half-life has a mean lifetime and vica versa. ***I again urge you to learn physic(s)***. I agree with everything he said. A free neutron has a half-life. The chances of the neutron decaying in that half life are 50:50. If you don't believe us, go ask the question on a physics forum, and stop pretending knowledge that you don't have. Yes, mate, I read what RNP said. That is why I further clarified the point of clarification for better treatment/term applicability in 'free' Neutron context/discussions. Again, I never disputed the 'half- life' convention as a GENERALITY per se; I merely SPECIFICALLY point out how that may confuse rather than help discussion re 'free' Neutron decay/stability etc PER SE. I further tried to clarify my aim, by directing you (and him too if he is reading this) to other instances (eg, KAON, PION cases) where 'half life' is also NOT really helpful/needed when considering the actual physics of THE 'free particle' per se (this needlessness is highlighted by the *total absence* in WIKI of the 'half life' term when talking about such particles (ie, 'free' Kaon, 'free' Pion...and in my opinion, by logical and effective similarity...the 'free' Neutron). How do you know there is a "cramped" constraint criteria for: 1 proton+one electron => 1 hydrogen atom? It's never been demonstrated in the Hadron Collider, so you can't come up with OBSERVATIONAL EVIDENCE for such an illogical conclusion. That it can't be proven that so-called "cramped" conditions can prevent the formation of hydrogen by: 1 proton + 1 electron=> 1 hydrogen atom, is only a matter of "conventional dogma" emanating from the Pop-Cosmology plantation of funny farm pseudo-science that you live on. Yeah, "dogmatic rules", it is a dogmatic rule that a neutron consists of the masses of three particles, but you Pop-Cos guys just keep forgetting that neutrino. By the way, for anyone interested, the half-life of a pion is ~ 1.8 x 10^-8s.